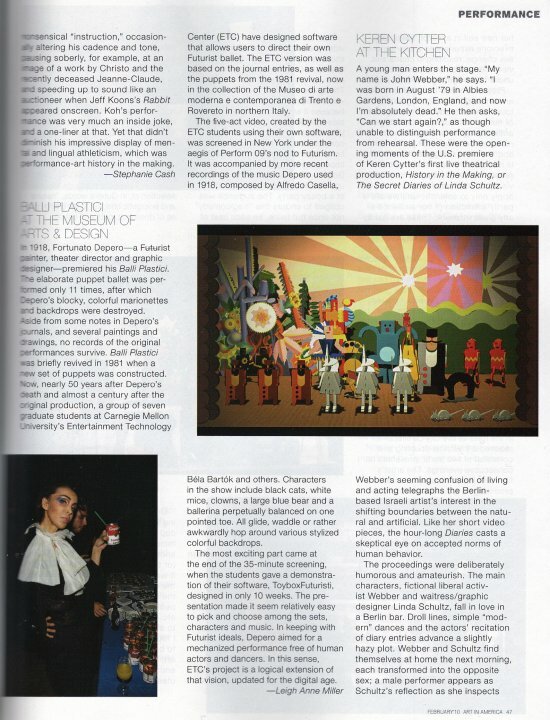 Depero Futuristi is a team at Carnegie Mellon University’s Entertainment Technology Center re-imagining Balli Plastici, the ‘plastic dance’ created by Italian Futurist Fortunato Depero in 1918. The marionettes used in the dance encapsulate the Futurist ideal of machinery striving to break free of human control. Our goal is to digitize Depero’s puppets and develop a toolkit anyone can use to create their own Futurist-inspired ballets. Our efforts will move the marionettes beyond mere appreciation, propelling them continually forward as living art. Our clients include Performa 09 and the Museum of Arts and Design. If you want more information about this project, ToyBox Futuristi or Balli Plastici at Performa 09, please contact us at deperofuturisti@gmail.com. Check out Balli Plastici on the web!